Most fans and historians interested in WW I tank use by the Allies have read “Landships” by David Fletcher or “Treat ‘Em Rough!” by Dale Wilson, but until this new book by Service Publications arrived there was very little on what the Canadian forces did with tanks. 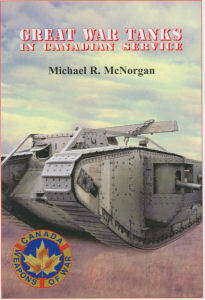 Michael Morgan has now filled the gap with this nice little history of the unfortunately abortive Canadian effort to get a Canadian tank unit into the war. After having the first actual armoured vehicle unit in Allied service – a machine gun artillery unit using armored vehicles – the Canadians did not design any indigenous tanks or produce the British designers in Canada. However, the Canadians did receive an allocation of seven French tanks during the debut of the weapons at Courcelette, France on 15 September 1916. The genius behind Canadian armour, Raymond Brutinel, then was asked to head up the Canadian tank effort and their first efforts saw the attachment of British tanks to Canadian forces. But it was not until January 1918 that a full-court-press was made for a Canadian-operated and manned tank unit was put forth. The responsible officer, Lt-Col J. E. Mills DSO, was a bit of a maverick and ahead of his time, so the Canadian command was happy to “exile” him to the nascent Canadian tank corps. The first step was to form a single battalion, with plans to have it trained and functional for the planned 1919 Offensive. The officer selected to train them, Lt-Col R. E. Denison OBE, had been wounded and sent back to Canada to recuperate. As a result Denison and Mills played roughly the same roles as two American lieutenant colonels of note – Dwight Eisenhower and George S. Patton, where the former men were “Mr. Inside” responsible for training at home and the latter were “Mr. Outside” working on their deployment and use in France. Tankers were considered a prestige arm, and the 1st Canadian Tank Battalion drew its personnel from the University of Toronto (A Coy), McGill (B Coy) and other universities (C Coy) and totaled 668 officers and men of all ranks. The battalion grew to 790 by 1 June 1918 when its “tail” of support personnel (e.g. clerks, medical, etc.) were attached. Arriving in England three weeks later, they moved to Frensham Pond for training. Training lasted until early November 1918 but as is well known the war ended at 11:11 on 11 November so the sole trained Canadian tank battalion never saw combat. A 2nd battalion had been formed in Canada but as it was shipped to England many of the men came down with influenza and were quite ill, 27 eventually dying of the disease. The Canadians did see fit to form a Canadian Tank Corps on 29 November 1918 but once all of the Canadian tankers were home (in 1919) the units were basically mothballed until 1936. A 1/35 scale tone plan by George Bradford is provided and covers a late-model Mark IV Male with the unditching beam rails fitted. Overall, this nice little book covers the history and when read with the other two works cited will give the reader a good picture of life in the tanks of WW I.